with the objective of alleviating poverty and promoting growth through raising Tanzanian Christian leaders who are equipped with excellence in wisdom, knowledge and Christian virtues. The responsibility of the day to day running of UAUT is vested upon the University Council with the Vice Chancellor as the main link between the Board of Trustees and University Council. 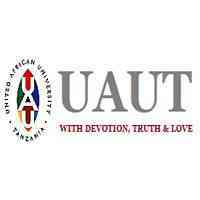 Send your detailed CV, Cover letter, Certificates (PDF) and Testimonials (if any to); hr@uaut.ac.tz Deadline 16th February 2019.